by ferry to spend the night with us. 6pm we broke open the duty free scotch and celebrated. After dinner we headed off too one of the small bars on the beach. This is Danielle's fist trip overseas, she couldn't believe it. Saturday Trenton, Danielle and Oney headed off for Lombok. WASHINGTON, March 22 (Reuters) The International Monetary Fund has forecast that Indonesian gross domestic product growth will expand to 5.5 percent in 2005 despite devastation caused by the Asian tsunami, and could rise to 6 or 7 percent in the medium term. In its second health check of the Indonesian economy since the country's IMF loan program expired in 2003, the global lender said economic performance would improve in 2005 despite the impact of the tsunami in the remote Aceh province, which accounts for just 2 percent of overall GDP. 550,000 new cases recorded annually. The World Health Organization (WHO) says Indonesia has the third highest incidence of TB in the world, after China and India. Since the unpopular increase in petrol prices from Rp1,850/ltr to Rp2,400/ltr (A$0.33) businesses are starting to jack up their prices, many using it as an excuse to increase their prices beyond the actual effect of the fuel increase. Many tourist restaurants have increased their prices or plan to in the near future. Warung Sobat increased their prices in January Mykonos tavern during March. Last month we bought you news of Melody's Soft Opening. 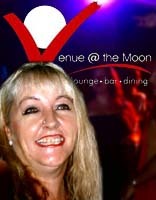 Saturday night, March 19, Bali came to a complete stand still for the Grand Opening of Venue@ the Moon. The "Who's Who" of Bali were in attendance for the gala occasion. The street was lined with hundreds of locals hoping to catch a glimpse of the glitterarti. James from Orange Boy Production did a great show with his dance troupe. 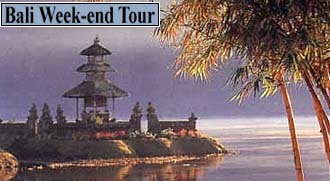 Bali Friday March 11: Nyepi, Balinese New Year. "The Silent Day" from dawn until dawn Saturday March 12 everyone in Bali must observe Nyepi by staying in their house, must not make any noise and must not show any light at night. The Bali airport closed at 0200hr and will open again at 0600 Saturday. We celebrated Nyepi Eve at Mystique restaurant, from there we watched the Ogoh-Ogoh (shown above) procession to the beach, where the are burnt. We made sure to leave for home by 1130 before the curfew started. 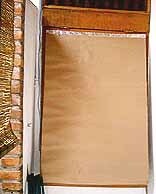 In our house we covered the windows with the sizalation covers we use each year. 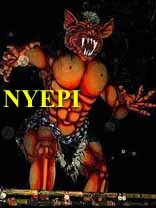 Nyepi occurs when there is no moon so it is pitch black. The smallest light will show from the house. Volunteer Pecalan from the Balinese Bunja organization patrol the streets dressed in black to make sure no one leaves their house or shows any light. No cars may enter the street or road. We just spent a quiet day in the house and celebrated with an early dinner of traditional Roast lamb from Australia. process we have added waterproof rubber boots to the chair legs. First Jamal found a second-hand bicycle tire at the local bike shop, this we cut into strips and glued with rubber glue on to the legs. Then a piece of 3-ply timber is nailed on to the rubber while the glue dries over night. Next day the 3-ply is removed. The "Boot" is trimmed with a knife and finally the edges smoothed with a cigarette lighter flame. Bali March 4: We headed off to friends Clive and Wendy's deluxe Vila Tenang for the night. We were looking forward to this as we hadn't given the KHO Jeep a decent run since it's major engine, overhauled. Vila Tenang (peaceful) is located 40km from the KHO. Due to the famous Bali roads it takes about 1½ hours if the traffic is not too heavy. We arrived mid afternoon and spent a pleasant time on their new balcony overlooking the pool. The Balcony affords wonderful views of the Indian Ocean and on a clear day you can see Java. Clive and Wendy's Chef served us a delicious dinner in their restaurant after, we sat and talked until late. Next morning we had breakfast again in the restaurant then headed off, following Clive and Wendy on their Harley Davidson copy motor bike up to Belimbing about 25 mins up the road in the hills towards Pupuan. We had had lunch there - they even had Mexican food. The mountain views were fantastic. Clive and Wendy's Vila Tenang is the prefect place for a get-away from it all holiday. 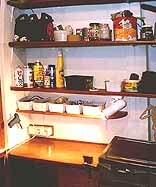 Completely private as they only rent to one group at a time, you have the place to yourself. Seven full time staff look after your every need. The accommodation consists of 5 double bedrooms in 2 Villas. What a bargain, 10 people can stay for as low as US$150 per night, that's only US15$ (A$19) each, per night, including breakfast and transfers. After lunch we wished Clive and Wendy farewell and headed further north in the direction of Lovina Beach. On the way we noticed Sanda Botique Hotel & Restaurant, we decided to drop in for coffee. The establishment is owned by Danish/Australian couple Lillen and Ted Kruuse-Jensen. The property was an old coffee plantation. Ted saw it and decided this is the place. They have a fantastic restaurant over looking the mountain views and 8 separate villa rooms for rent. The Coffee plantation has been fully restored and the Hotel is self sufficient in coffee. Whilst there, I bought a pak of coffee beans, couldn't wait to try when I got home, beautiful coffee. Normal room rate is from A$108, however they have a dinner/room package for A$93 per night. Ted is famous for his free cocktail hour, serving his secret pink gin cocktail. 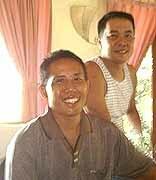 Ted and Lillen will make you most welcome. After foretelling Lillin and Ted we headed of on the very windy mountain road to Lovina beach. The KHO Jeep performed extremely well, the overhauled engine taking the mountains in its stride. Unfortunately we missed the left turn at Seririt Market and headed in a westerly direction, half an hour later we sighted the sea on our right, should have been on the left, we checked the map and found we had gone all the way to Grokak. We turned around and went back. By the time we arrived in Lovina it was almost dark so we decided to stay there the night. I thought I would try and find Astina, the place I first stayed at 25 years ago, last time 11 years ago, and see if it still exists. After a bit of searching we found it. No longer a dirt road through the jungle to the beach, but a fully developed street full of gift shops and restaurants. We arrived, one of the original staff members from 25 years ago was there and still remembered me. We checked in and took one of the new, built 8 years ago, rooms complete with hot water, bath air-conditioning, free breakfast and all for only A$20 per night. We showered and had a few trusty Johnny Walker cocktails. Then we headed off to Tropis Club for dinner. Very good and only half the price of Kuta restaurants. They had a good selection of wines Being Saturday night the place was crowded with locals and tourists. Waitress Ayu at Tropis Club. When we returned, I was dead tired and went straight to bed, Jamal joined the staff in reception, where they drank beer and watched soccer until 2am. Next morning we rose early and enjoyed the complimentary breakfast of toast, fruit, an omelette and Bali Coffee. When I went to reception I noticed this sign. Hopefully they are referring to the bell at the reception desk. We find out Nyoman is not only the room boy but the cashier - apparently he also cooks the breakfast. I'm horrified - "How cheap!" Around 1130 we headed off for Bedugal, initially the road was not bad until we started climbing the mountain, a climb of 4.590 ft., one hairpin bend after another. The direct distance for crows is 18km whilst the road is 35km. Certainly a test for our newly overhauled engine. Bedugul has 3 lakes in volcanic craters. Lush pine forests that make for fresh clean air. Wonderful to get away from the humidity of the Bali lowlands. 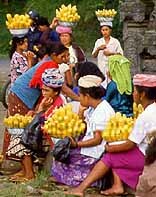 The area is renowned for its fresh fruit and vegetables. After lunch the downhill home stretch to the KHO in Petitenget, feeling happy after a good break. Bali Wed Mar 9: We held a dinner party at the KHO. Guest's of honour were Peter and Hargen from Germany, they helped John to hospital when he fell and cut his head in December, last year. We began with cocktails in the terrace, then dinner was served. Also in attendance was Norman, Ines, Freddy and Andi. Lombok friend Hamdani along with his Japanese wife and son Danny, dropped in at the KHO to say goodbye, before departing to Japan and then on to Australia. JP Mar 19: The Indonesian Government has sacked the board of management after it was announced that Garuda may have suffered a loss in 2004 although revenue is projected to be higher (US$1.07 billion), a 20%up from 2003, attributed to a 1 million higher passenger load of 8 Million. Danamon, as Garuda's new president and finance director. Mar 19: Minister of Culture and Tourism, Jero Wacik announced changes to the VoA policy which will include 16 more countries and extend the stay period from 3 days to 1 week ($10 visa) and 30 days to 60 days ($25 visa), he declined to to give a date for the changes. To cover yourself from a Hard Disk failure make a duplicate Hard Drive. Before your C: drive crashes buy yourself a new hard drive and install it as a slave D: drive. Fully format the drive in Windows and run the Scandisk full surface test. Open & RUN in the Start Menu. This will make an exact duplicate of your C: Drive. If your hard drive fails, just start up on the D: Drive. If your C: drive is totally had it, change the cables to make your new drive the C: drive and change the Master/Slave setting. 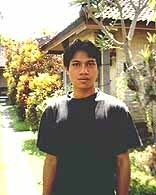 Peter Pan adalah satu lagi harta karun yang berjaya di cungkil bakat mereka oleh arus persada muzik Indonesia. suggestion to help the airline convince future passengers they weren't being poisoned. "Before serving food and beverages, flight attendants should taste the food and drinks in front of passengers. If nothing happens to them after five minutes, the flight attendants can then serve the passengers,"
At the far end of the computer room at the KHO we have built a new workshop area for the constant maintenance and innovation required at the KHO. 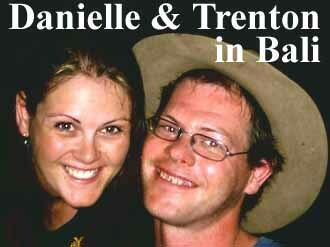 Friends Ian & Mandy from Bendigo, Aus., who visited Bali last September sent this report. Thomas and of course their parents Cliff and Jean – This about the third one I've been to. Mandy’s cousin Rod who's place this is held owns this huge 130 sq house on 100 acres – he goes to a lot of trouble and sets it up to cater for all tastes – ala billiards, tennis, rowing in the creek, horses (he breeds Clydesdales) It’s the kind of thing you think is a bit of kitsch idea but I guess we'll look back and think it was pretty good, it was enjoyable and it meant something. no doubt depositing or uplifting another entourage of royalties with their shopping. jet, which he spent US$12 million to customize, adding, among other conveniences, a jacuzzi. 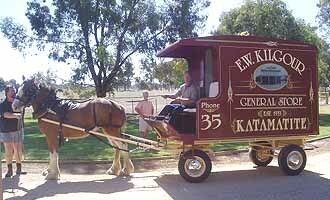 bought cattle stations in Australia, so that he now owns more of Australia than he does of Borneo. The sultan lives in the world's largest palace, a 1,788-room behemoth that, in size at least, is comparable to the Vatican. Last month we told you how an Atom Bomb works, this month we give you the Hydrogen Bomb. dense mass, which initiates a process called nuclear fusion, releasing great quantities of energy. This process is difficult to achieve; it's been described as trying to squeeze an unopened can of Coke into a little ball without spilling any Coke! But there's more! As the core explodes, it causes the bomb casing, which is made from uranium, to undergo fission, creating even more energy. In other words, an atomic bomb sets off a fusion bomb, which also triggers another atomic bomb! physicist. His work on national defence projects such as the Manhattan Project and the Strategic Defence Initiative helped protect our Nation and bring about the end of the Cold War. Yet Teller also will be remembered for his role in destroying the career of his one-time boss, Robert Oppenheimer, which alienated Teller from many of his colleagues and for pushing the H-bomb and the Strategic Defence Initiative on grounds that, in the opinion of critics, were sketchy or dubious. Teller's staunch support for defence stemmed in part from two events that shaped his dark, distrustful view of world affairs — the 1919 communist revolution in his native Hungary and the rise of Nazism while he lived in Germany in the early 1930s. Edward Teller managed Los Alamos research on the "Super," as he called the hydrogen bomb. Destruction of Hiroshima and Nagasaki in Japan and the end of World War II slowed "Super" research. Teller, a strong anti-Communist and sensitive to U.S. and Soviet relations, pushed unsuccessfully to accelerate work on a super-bomb. He was frustrated by the post-war direction of Los Alamos. He accepted a University of Chicago professorship and left Los Alamos in October 1945. In April 1946, Teller returned to Los Alamos and led a secret conference on the "Super." The conference reviewed his earlier work on fusion, which led to his full-time return to Los Alamos in 1949 to continue research on the hydrogen bomb. He died September 9, 2003 at age 95. 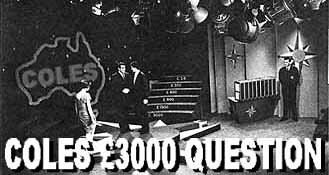 Coles £3000 Question began on HSV-7 in 1960 with Malcom Searle as quiz master assisted by Janet Mead. In those days £3,000 was a lot of money. My junior 16 year old salary at HSV-7 for a 40 hour week was at the time £5.15.00 (A$11.50). No facilities were available for direct broadcast in those days so the show was originally kine recorded (later video-taped) and distributed. The national Coles department store sponsored the show. On the occasion of a contestant winning the £3000, Coles founder Mr GJ Coles would present the prize. Mid 1960 the show was video taped with the arrival of channel 7's new RCA video machine from the USA. 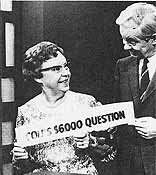 Queenslander Malcom Searl compered Coles £3000 question from 1960-1963. becoming one of the first Australian national Television personalities. 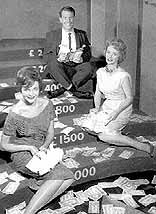 One day in 1963 Malcom Searl failed to turn up for the taping of the show. There was great panic in the studio. We were told he had had a nervous breakdown. The show's producer Roland Strong stepped in at the last minute to fill in as compere until a new one was found. It was decided to hold Auditions. I was at the teletheater for the auditions. it was chaos every would be-actor, television personality turned up. To our surprise even one of our audio staff, Andy Bickford turned up to audition. The auditions went on for hours, with the directors floor speaker squawking out "NEXT, THANK YOU - we'll let you know" The atmosphere was gloomy every one could see there was no one anywhere near to the suave Mr Searl. Most were hopeless. Between the Audition and the next taping we were all kept in suspense as to who would be the new compere. The newspapers and Tv weeklies all buzzed about it. Finally it was decided, as Roland Strong was doing a good job, he would become resident compere. He was assisted by hostess Beverley Robbins and the announcer was Max Rowley. Roland strong still produced the show, but was assisted by Greame Bent. t Shillings and Pence to Dollars and Cents. One Pound would equalled 2 Australian Dollars. Initially the government wanted to call the unit of currency the austral, merino and royal. There was such an outcry, the government settled on the A$. A portrait of Queen Elizabeth, engraved from a photograph taken by London photographer Douglas Glass, appeared on the front of the first Australian $1 note. On the first Wednesday after the decimal change over Coles £3000 became Coles $6,000 Question. Later on the prize money was increased to $7,000. However this was no match for opposition Channel 9 show Money Makers compered by Phillip Brady which offered a $25,000 prize. The show eventually folded in 1971 when the Coles company withdrew sponsorship. Rowlans familiar farewell "Goodnight Australia - Goodnight"
I often worked on Coles Quiz, playing intro/outro music, themes. The music was specially recorded by the 7 orchestra. The dozen or so tracks were pressed on a LP recording to make cueing up of the many different tracks simpler. With 2 turntables and 2 one-sided disks any track could be played almost immediately. The LP was specially pressed by W&G records Melb.